Busy time for a Blaenau Ffestiniog, green guesthouse. Blaenau is very lucky having a glut of renewable energy. It's 700ft high, alpine setting provides ample sun, wind and rain. It has 3 commercial hydros and a massive pumped hydro scheme that moves a whole lake up a mountain to store energy. All this is capable of providing more energy than Blaenau can ever use. 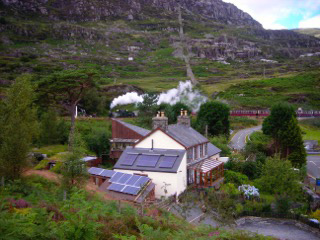 At the tiny scale of things, is this local, 6 bedroom guesthouse that has shown how to run on only renewable energy. All energy inputs are from renewables, even for the sauna and 3 electric car charge points. They have recently been involved in two national / international sustainability awards. Wales Green Energy Awards. This Blaenau 3 star guest house made it to the shortlist of 3 against the National Trust ( Wales ). Judges were impressed with how they choose to share there green business practice. As owner John Whitehead says " many politicians / business have carbon reduction policies / targets. We have gone one better, all energy used is carbon free. Period...... Come to Blaenau and explore our energy heritage that goes back to Victorian times but forward to revamping of the Cwmorthin 350KW hydro plant this year. In these times of rising energy prices and climate change, some would say Blaenau has a moist environment. I would call it energy rich." International Sustainable Technology award. Judges at Bangor and Irish Universities recognised the advanced work and free sharing of sustainable success. Intergration of solar thermal and solar electric with wood gasification boiler is just the start. Insulation and cunning building development has made this area of Wales a leader in sustainable tourism.